Article in the magazine about Tom Lamb's efforts to raise prime Hereford cattle in Northern Manitoba. 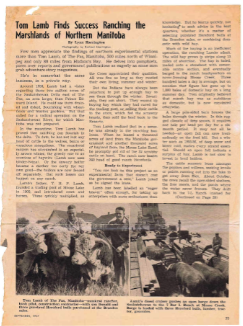 Hereford Magazine September 1957, "Tom Lamb Finds Success Ranching the Marsh Lands of Northern Manitoba" by Lyn Harrington. Click on the photo to read the entire article. 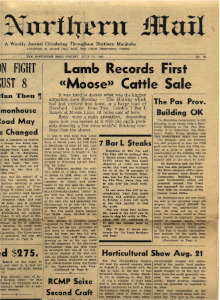 The first sale of "Moose" cattle from the 7-L ranch. Click on the photo to read the entire article.